The electro-physiology of neuronal population is better understood by the aid of distributed sensing. 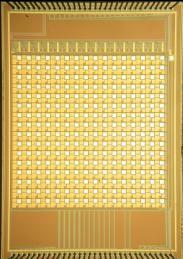 Single-chip neural interfaces offer a miniature, low-power, low-noise solution for implantable microsystems. We have designed and prototyped a brain-chip neural interface that simultaneously acquires 256 extracellular action potentials from a 16 x 16 electrode array with a 170um pitch. The circuit implementation includes programmable gain amplification with low input referred noise (13uV RMS), low pass filtering and high pass filtering to reject random offsets. Each cell also contains a memory unit for simultaneous sampling. After sampling, the array output is read-out, quantized and sent to a PC.